Reverend Productions presents Bram Stoker’s classic horror story complete with monsters, heroes, love and death in a world where nothing is certain and everything is at stake. I am told that this project took 6 months from idea to fruition, the adaptation of the 1897 novel having been written by three of the "crew". Alas, I felt the play retained too many traces of its novelistic origins to convince as staged drama, with frequent prolonged rhetorical outbursts, delivered in a sort of hysterical mumble from the madman Renfield, and much desultory chin-stroking pondering from the doctors in search of a diagnosis. I only jumped once when the coffin fell open with a satisfying clack, and not a single scream from the audience was heard, surely one test of a good production of Dracula. And the best scene in the novel when Harker sees the Count crawling face downwards like a giant bat along the stone wall of his castle was inexplicably omitted altogether. Count Dracula (Tom Hathaway) appeared at the start more butler at Waddesdon Manor than sinister host, but he warmed to the part in the second half, if I can put it like that. Saattvic as Prof van Helsing cut an authorative figure but never really developed beyond statuesqueness. But the two stars were the make-up artist, the delightfully-named Emma-Lucy Pinchbeck, whose liberal use of her blood-and-gore budget belied her name and pleased the eye, and Mansfield Chapel itself whose late Victorian interior, perfectly in tune with the era and content of the play, and nicely lit by Mike Bedington, was a great backdrop. Reverend Productions' next show will be worth looking out for, though the Director James O'Neill would do well to rewrite his supplied profile since the one here was the silliest I've yet seen in an Oxford student programme; and the competition is quite fierce. 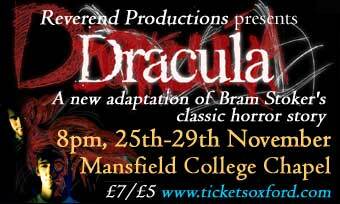 Tom Hathaway as the Count gives us a pleasantly chilling runaround in this new adaptation of Dracula by Reverend Productions at Mansfield College Chapel. Appealingly pasty, fresh blood forever moistening his lips, he pops up here, there and everywhere, falling on lily-white necks to keep his evil powers fully charged. What he hasn’t taken into account is that the determined Professor Van Helsing (played by Saattvic) is onto him and has the time-honoured weaponry – crucifix, garlic, hammer and stake – at his disposal. Bram Stoker’s 1897 epistolatory novel has been adapted by Reverend into a caper which, although not always easy to take seriously (at times I was reminded of Scooby Doo), carries conviction at most of the moments that matter. Chelsea Walker as Lucy gives a particularly stirring performance: drained of blood, transfused and drained again, she finally succumbs to death, only to rise from her coffin and cause more hassle as one of the undead. Sam Bright and Esther Edlundh-Rose do well as leading couple Jonathan and Mina Harker, and Drew Darr gives his all as the convincing if slightly inaudible lunatic Renfield whose job is to show us what this story is really about – control. Just as Dracula likes to control by taking blood, the asylum inmate Renfield gets his kicks from his obsession with small animals – collecting and eating them. Is it that we are all secretly like this, longing to dominate, to prove that we exist? But what is it with Dracula? As anyone who has spent a weekend in Whitby recently will know, the fascination that he holds shows no sign of fading, and in this sense he controls us still. Evil of his sort – clearly labelled, velvet-jacketed, romantic – is attractive and straightforward; even the undead can be put to bed quite easily when you know the formula. Unsatisfying in a way, but don’t we, many of us, simply love it. The setting of the chapel is perfect for Dracula. We really enjoyed last night's performance. I'd advise wearing warm clothes and taking a cushion for the chapel chairs! Don't expect any refreshments at the interval, unless you take your own.